The heat wave continues. We opted not to go to Maine for the weekend because of the weather predictions. There were some showers on Saturday, but not much rain at all. Friends on the other side of town said they had a deluge, so we were in some kind of dry pocket. That’s too bad because the garden could have used a long cool drink. Sunday was sunny and dry all day. We’ve been eating lots of salads and other cool, low- or no-cook meals: more gazpacho, beet salad, corn on the cob, and tomatoes with fresh mozzarella. My favorite was the Red, White, and Blue Potato Salad. 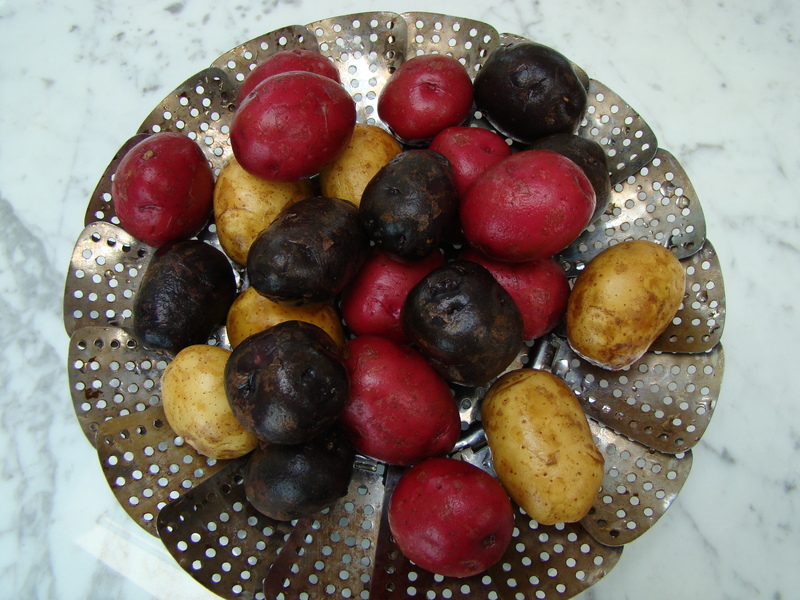 Last week, I found red, white, and blue baby potatoes at the Lexington Farmers Market. I was going to make them into potato salad for the Fourth of July, but I forgot to bring the potatoes with us to Maine. So my potato salad had a one week delay. Usually, I make my potato salad with a Dijon mustard vinaigrette. 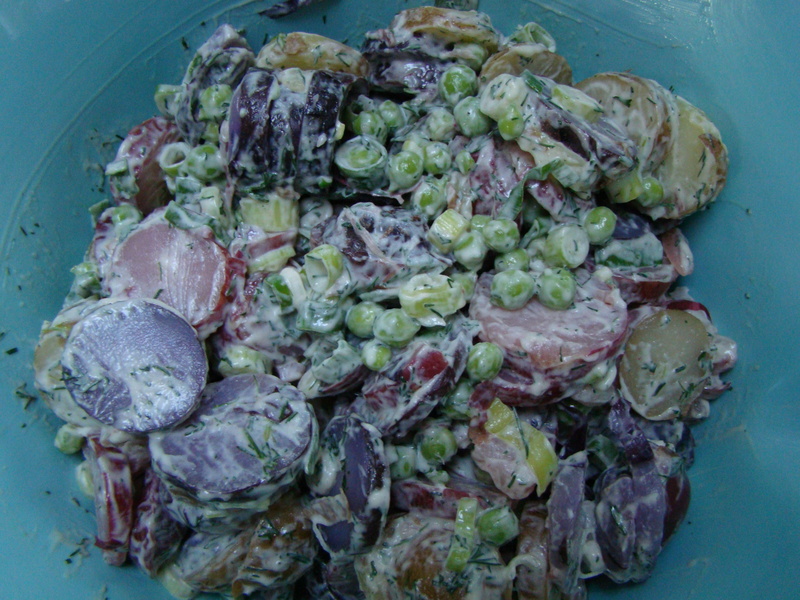 I got it into my mind that I wanted to make a creamier potato salad with fresh peas and dill. I cooked the potatoes and shelled the peas, but then, AFTER I’d been to the grocery store, I realized we were out of mayonnaise. There’s usually a jar in the fridge, Hellman’s or Trader Joe’s. Somehow, I didn’t know it was all gone. I thought, “No sweat, I can make mayonnaise.” I buy fresh eggs, often from the farm where they are laid, so I am not concerned about salmonella. I pulled out the recipe card, and I sighed. In big letters at the bottom of the card, I had written “DON’T MAKE IN HOT AND HUMID WEATHER.” Obviously a note from a past experience. That corresponded to the exact weather we’ve been having, but the mustard dressing just wasn’t going to match the flavors of the peas. I went ahead with it. Unfortunately, the recipe card said the mixture should be starting to thicken after about half the oil was added. It was still really runny. Maybe it was doomed. I added a spoonful of Dijon mustard and continued. Magically, as I added the remaining oil, it finally emulsified. I was back in business. I was happy with the end result. The salad was the creamy potato salad I had envisioned. The green from the peas, scallions, and fresh dill gave it a fresh look. The patriotic colors of the potatoes gave it a fun look. It was delicious, though Howard says he prefers the one with the Dijon dressing. I’ll go back to that recipe next time. Scrub the potatoes, and pierce them 2-3 times. Steam the potatoes until tender, about 30-40 minutes. When the potatoes are cool enough to handle, cut into ½-inch slices. Place the potatoes, peas, scallions, and chopped dill in a large bowl and toss gently. Add the mayonnaise and continue to combine, gently, until everything is coated. Season with salt and pepper to taste. Posted on 13 July 2010, in General and tagged hot weather cooking, potatoes, salad. Bookmark the permalink. Leave a comment.